If you browse the Internet enough, you will often find pictures of unbelievably big or small versions of things you can normally imagine. These things can vary from all sorts of items, whether it is food, animals, toys, or even day to day objects. However, with the way digital media is, these pictures can be altered in order to make things appear bigger or smaller when they actually are not. Uploaders often place another normal sized object into the same photo for reference. A person like me would expect people to put things like a ruler or measuring tape, as it gives a standardized size and unit. However, problems can still occur, as it is not always the easiest to visualize a certain measurement, nor is a ruler always handy at the time of photos. As such, people chose the banana to be the universal choice of scale. It is not like they had some sort of vote or decision, but like many memes today, someone did it once, and a lot of people followed after them. I often laugh at these pictures just due to the fact there is a banana in the picture, but they serve as a decent way to keep things in perspective, literally and figuratively. Thus when I received today's review unit of the SilverStone SX700-LPT 700W, an SFX-L power supply, the first thing I had to do was snap it to my friends with a banana for scale. I knew the dimensions of this power supply beforehand, but it was only when I saw it in person did I realize just how small this power supply is. As you already know, small does not necessarily mean low power, and this power supply proves so, but is there more to the unit than just its size? Read on to find out! 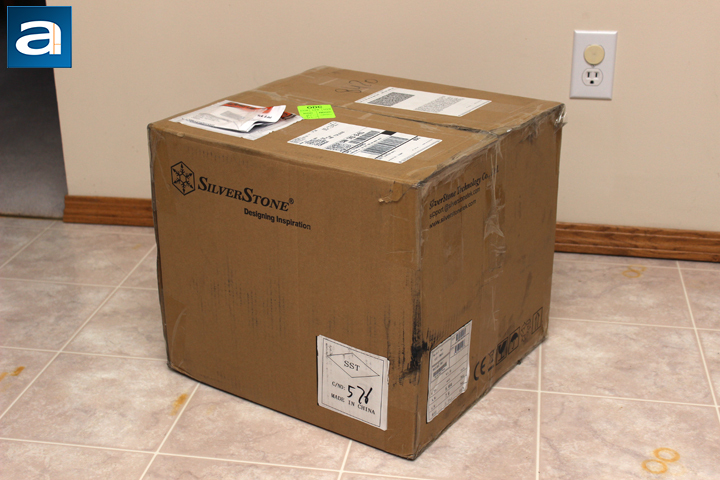 Today's review unit of the SilverStone SX700-LPT 700W arrived from SilverStone's offices down in Chino, California. This large box arrived at our APH Networks Calgary offices via UPS Standard. The box itself is in decent condition, with no big dents or scratches to speak of. Along with the power supply, we also received the Sugo SG13WB and the PP08. Everything was protected in this box with packing peanuts, which is a messy but capable way to ensure safety for the products inside. The SX700-LPT's retail container is a pretty standard box, with a teal coloring scheme going on. The front has the power supply printed on the side, in a smaller scale, and the right side shows the product name. SilverStone's logo and tagline is pasted on the top left corner. One thing I like is the naming of SilverStone's SFX power supplies, as they are practical and straight to the point. For example, with the SX700-LPT, you can see how the name breaks down. The SX and L part of the name denotes this is an SFX-L sized power supply. The 700 says this power supply is rated to deliver 700W. Finally, the PT denotes the fact this unit is rated to an 80 Plus Platinum rating. Otherwise, several more features are listed on the front in the bottom right hand corner. Around the sides and the back, we have more information. 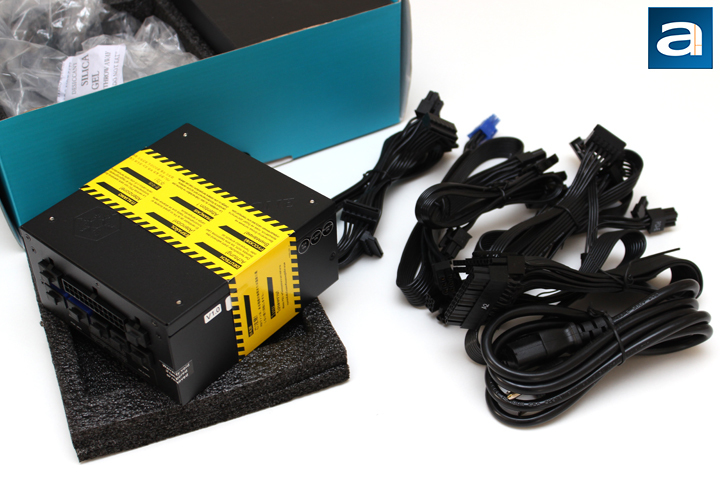 The SilverStone PP08 was also sent to us for review, and this is a standard SFX-to-ATX power supply mounting bracket. This adapts the smaller SFX mounting holes to the more standard ATX one, making smaller power supplies compatible with more cases. There is pretty basic packaging for this bracket, as it is just a cardboard box. 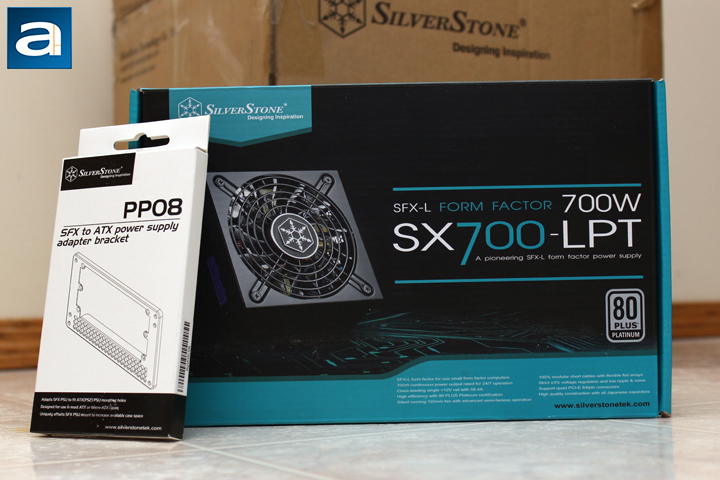 Out of the box, you have a standard set of accessories included with the SilverStone SX700-LPT 700W. The power supply itself is wrapped in a plastic bag and cushioned with two foam brackets to ensure there is no damage to the unit during transport. Two pieces of documentation are held in a plastic bag, and this includes installation, warranty, and technical information. Finally, underneath a cardboard bracket are all the cables. This includes an AC power cable and all the connectors to the computer components. As for the PP08, inside the box is the metal bracket in addition to four screws to help with mounting. A small instruction manual is also provided, but installation is quite straightforward.